One of my favorite parts about doing sensory play during the summer is that we can take the mess outdoors. 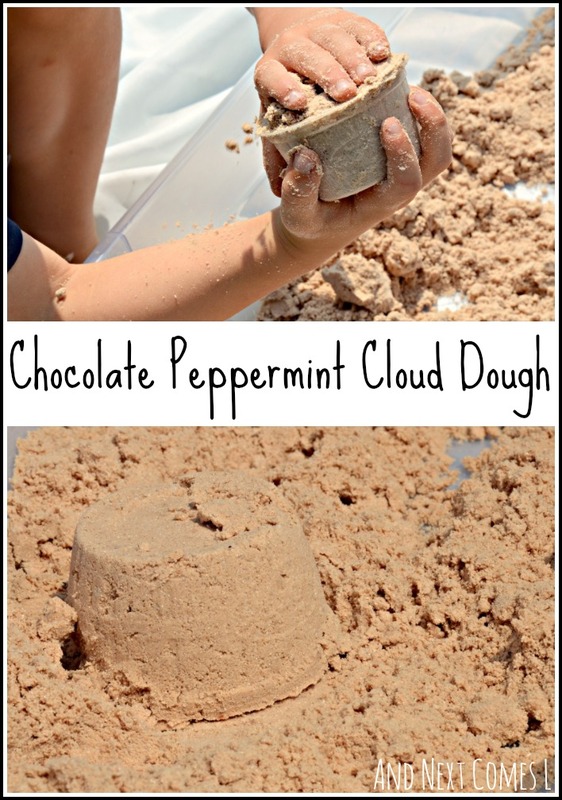 Cloud dough is one of those messy activities that is just perfect for outdoors. I decided to use some of our new essential oils to recreate the classic combo of chocolate and peppermint in cloud dough form. And goodness. It smelled heavenly! The warm chocolate smell mixed with the cool, refreshing scent of peppermint...mmmm...if only computer screens were scratch and sniff! I only happened to have 1/4 cup of cocoa powder on hand so I used primarily hot chocolate mix. So the cloud dough didn't turn out as chocolatey in color as I hoped. However, the wonderful scent trumped the color. And honestly, the boys don't really care what it looks like. Just like any regular cloud dough recipe, this chocolate peppermint concoction can easily be molded into different shapes. How long does the cloud dough last? Well, I sealed it in a zipper seal bag shortly after playing with it. We still have it 18 months later and it's still good to play with, although it doesn't smell as pepperminty anymore.